The General Exception Definitions Settings article describes how to create periodic scheduling exceptions definitions. This is used when scheduling an exception that runs across all work centers and groups. If no exception have been entered, click "Add New"
Use the scheduling dialogue, schedule a one time or recurring event. I.e. a holiday, plant shut down, or other. Click save, will save the exception and apply it to the capacity schedule. The example above schedules the July 4th Holiday as a non working day. 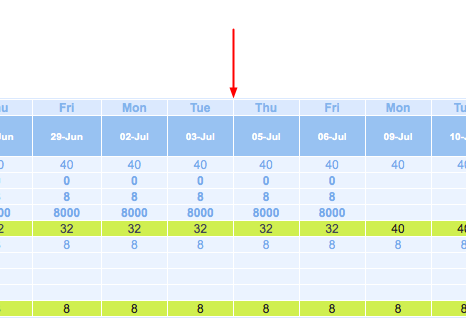 As shown above, the July 4th exception is removed from the schedule in order to treat it as a non-working day. As stated, there are General Exception Definitions and Capacity Exception Definitions. Capacity exceptions always overwrite the General exceptions. For example, if you have a holiday scheduled and will be working a holiday for some reason, the capacity exception will overwrite the general holiday exception for this one instance. Within the same type of definitions the latest one always overwrites the previous ones.